Moving image texts tell a story just as any written text you would use with your class does. As a teacher you are used to discussing many aspects of a storyline as you read through a book. The same discussion you would have about a written story can be applied to the story contained within a moving image. 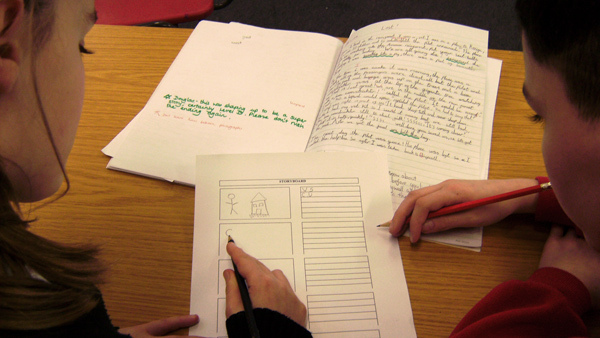 Moving image story activities can be inspirational to pupils accustomed to a daily diet of written text. Pause early on and discuss whether it is similar to any written texts they know. From this can they predict the storyline? How has the film maker grabbed their attention from the beginning, and if so how? Pause at key points for the pupils to describe their reactions. Surprises and puzzles within the story often lead to interesting discussion points. Endings are also good talking points - was it expected or a surprise? Watch or download one of the great films on this site. What might happen next after the end of the story? Continue the story keeping true to the film style. Rewrite the story from the point of view of one of the lesser characters. Remember they might only know certain information! Narrate the story in the style of a television reporter. Have quotes from characters. Write and act out the producers 'pitch' for the film - again relating to persuasive writing. A pitch is how to sell a movie by just talking about it! Give the pupils 3 minutes to deliver their pitch, bearing in mind they are trying to convince a studio to part with their money. To be successful they need to tell the story outline with bundles of enthusiasm, know their target audience and convince the studio that this is going to be the blockbuster of the year! Brainstorm words describing the plot - use these to create an advertising poster for the film. Write a film review for a local newspaper including a summary of the plot. Where do we find stories? Collect as many responses as you can - your list might (or should) include pantomimes, shows and plays, tv, film, newspapers, documentaries, sitcoms, music videos, people telling stories, adverts, video games... (use our platforms section to help you out).